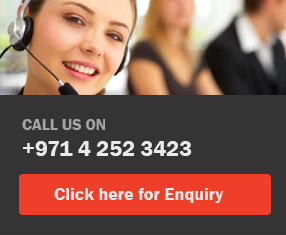 PDF documents can be signed inside the pad and not in the insecure environment of the PC. The biometrics from the signature can pad RSA-encrypted inside the pad and not in the insecure environment of the PC. The pad LCD-screen content with the signature can be RSA-signed inside the pad. Each pad has a separate and unique RSA certificate from delivery. Saving from custom RSA-certificates inside the pad. The pad can generate an RSA certificate inside. The signotec LCD signature pad "Omega" is the big brother of the successful "Sigma". 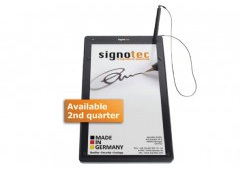 A signature capture device "Made in Germany" fully developed and produced by signotec with an unparalleled price/performance ratio. With outside dimensions of 180 x 191 x 15 mm it is extremely compact with an especially appealing design. This device allows you to set clear trends at your POS. The powerful signature pad captivates with a flat surface without edges between sensor and housing. The design makes for ultra-ergonomic signing. Pen and sensor convey a feeling similar to writing on paper. Plus, the rounded sides allow the heel of the hand to transition smoothly from signature tablet to table, without disrupting the signing process. The pen itself has the size and feel of an actual ballpoint pen and works entirely without electronics and power supply. Replacing the passive pen is inexpensive and the pad can continue to be used if the pen is lost. 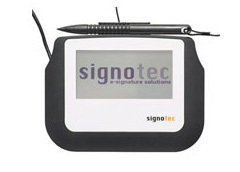 The signotec LCD Signature Pad "Sigma" is the little brother of the successful Signature Pad "Omega". 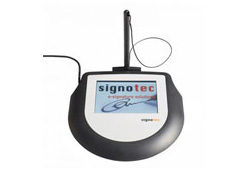 The "Sigma" is a device for capturing signatures, fully developed by signotec and made in Germany, with an unbeatable price-performance ratio. Measuring just 160 x 120 x 10 mm, it is extremely compact and is therefore ideal for mobile use. When it's stationary it still shines with it's flat contruction and the optional pen holder.